Did you know, internet video traffic is expected to be over 80% of all consumer traffic in the next four years? The digital landscape has constantly been changing for the last ten years. If by now you haven’t heard all the rage about video content, and how it can drastically improve your marketing efforts, you might be living under a rock. Many marketers are referring to the year 2017 as the year of video marketing. Why? Because video content is POWERFUL. Even though video content has some of the best ROI in the industry, less than 60% of business are utilizing it. Why Should You Be Using Video Content? As the human population continues to dive deeper into information overload, our attention spans are getting shorter. When you combine shorter attention spans, with people who are always on the go, it shouldn’t come as a surprise that people are four times more likely to watch a video about something than reading about it. Video content also has a higher recall retention rate than any other content. Facebook and Nielsen teamed up to gather data about Facebook’s video platform and learned that 74% of the total Ad Recall can be achieved within the first 10 seconds of the video. How Should You Be Using Videos? There are a number of ways that videos can be used to the benefit of your marketing strategy. Many businesses are ignoring video content because they don’t believe that they have the resources to take advantage of it. Truth is, you don’t need a long professionally produced video by Michael Bay for it to be successful. In fact, over 56% of videos published last year are less than 90 seconds long. Below we’re listing some of the more common ways you can use videos and what kind of benefits you can expect to reap from using this content medium. Let’s face it, a traditional “About Us” page on a website rarely ever resonates with people in the year 2017. What can make a tremendous difference is video content that conveys the story of how a unique company got started and the celebrates the company culture. From this 37 second commercial, you can tell that what makes this coffee company completely different than the thousands of other coffee companies that exist, is that they not only have an adventurous and humorous tone, but they are also huge advocates for supporting American veterans. Video allows viewers to associate emotion with your brand’s message which makes it a very effective medium for branding. Storytelling through video content helps your consumers feel like they relate to your brand which can creates brand preference and authority for your brand. Did you know 1 out of 4 consumers reported losing interest in a company if they don’t have video? In addition to telling your brands story through video, there are many other ways to use videos for your website content such as explaining how a complicated product or service works. Another great method of using videos for your native website content is through customer created testimonials videos which can take the load off of some video production while also providing great valuable and emotional content for your website. Product demonstration videos, testimonials, or even a video of your FAQs could also be incredibly effective at increasing your conversion rates through your landing pages. In fact, multiple studies have shown that adding videos can increase your conversion rates by 80%. Aside from telling your brand story and creating visually appealing content, video content also has great search engine optimization benefits. While it’s okay to have your video content formatted directly on your website, it’s not a bad idea to link them from your YouTube channel. After all, YouTube is the second largest search engine in the world right under Google. Speaking of Google, YouTube is owned by Google. It should go without saying that having videos on YouTube and on your website will boost your SEO efforts. However, if you decide to host the video on your website without YouTube, both the video and supporting text will still help the page ranking pages because your website traffic will likely stay on your website longer which dramatically improves your bounce rate. Using video content from your website on your social media pages is a great way to give your brand exposure. Every day there are over 500 million people watching videos through social media platforms. On Facebook, videos are currently getting the 135% more organic reach in comparison with all the other types of content. Not only does the Facebook algorithm love videos, but so do Facebook users. Facebook users generate 1,200% more shares of video content than text and images combined! These statistics ultimately benefit your business by saving you money when you start using Facebook ads. 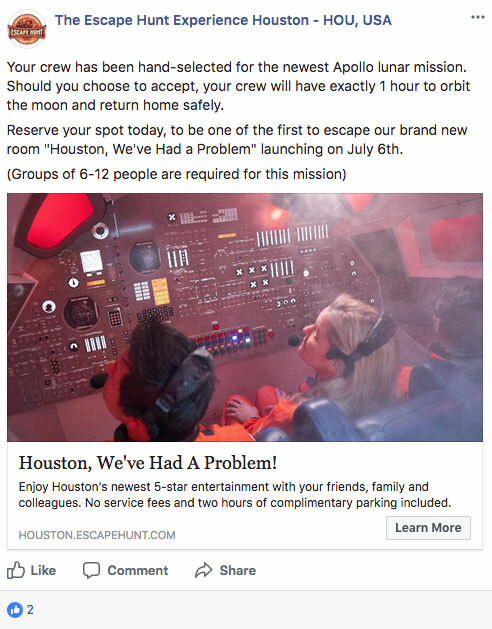 At MARION, we put these reported social media statistics to the test, as we created a Facebook ad campaign for our client Escape Hunt Houston. Both of these Facebook ads were in the same campaign with the same budget, for the same amount of time. Can you tell which one of these was a video versus a still frame photo? Another great way to take advantage of social media for video content is using the Facebook and Instagram live stories feature. This alerts all your current followers that you are broadcasting live and allows them to directly interact with your brand and see the real roots of your brand. Some great ways to execute live story videos is conducting live interviews with influencers in your field, showing how something is made or conducting a live Q&A with your fans and followers. Once the video is done showing live, it will reappear on your feed and live on your social media forever for your future audience to see. Pro Tip: Still need some inspiration? 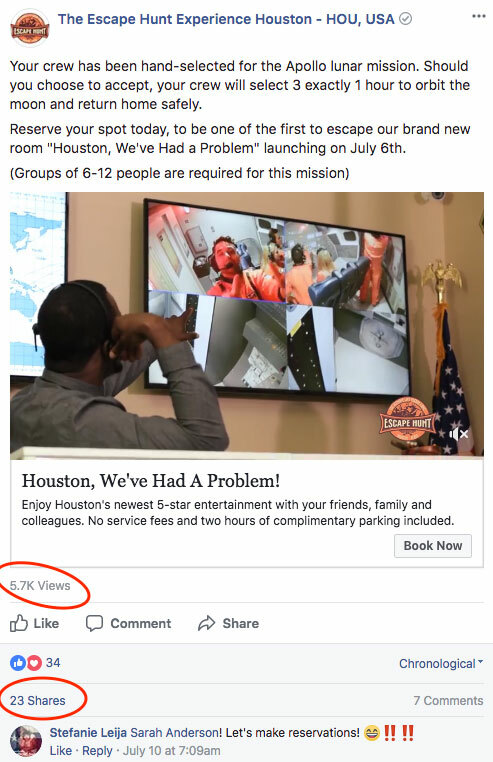 Check out this list from HubSpot of major brands who executed their own watch-worthy Facebook Live videos; you’ll notice most of them feel very organic and not as if a scripted production. Email marketing might not be an obvious place for your video content to live, but did you know that videos inside of an email marketing campaign actually provides a 20% boost in open rates and higher click-through rates? In addition, email subscriber dropout is also reduced by 75% when video is incorporated. Given that email marketing and video marketing has some of the biggest ROI in the marketing industry, why wouldn’t you combine these two together for explosive results! It’s no doubt that video content is worth the investment, regardless of how you plan to use it. 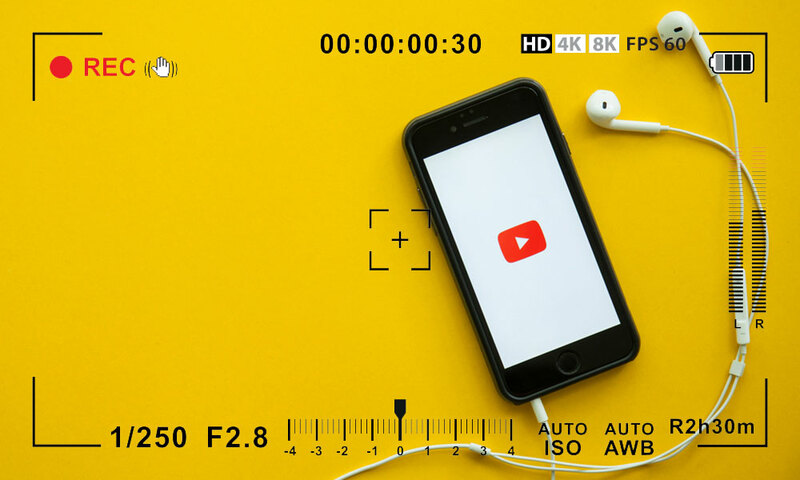 If there is one common denominator that we can pull out of these 5 ways to incorporate video in your marketing mix, is that people really love videos whether or not they realize it. Just like all your other internet marketing materials, if you start using video content and find that it doesn’t start generating better numbers for you, it may require some tweaking. Some examples of ways you can tweak your video content can range from website placement to choosing whether or not to play automatically. If you still need help, you can always contact us to start getting your video campaigns headed in the right direction. Have you asked yourself recently why you’re not taking advantage of the video marketing revolution?